Afi Mountain Wildlife Sanctuary four hours ride away from Calabar in Cross River state on the Nigerian side of the Cameroon border, promised to be a worthwhile experience. The closer I got to the Reserve, the more scenic it became until, negotiating the final twenty kilometres, I knew a day would not be enough time for me. This truly was rainforest, the real thing – red dirt track winding through undulating hills of tall, tall trees, vines, thick green undergrowth, sunlight blocked out. Afi mountain itself rose up dramatically from the forest. The Sanctuary had fairly basic facilities – a few guest huts, ablution block and the open sided living, dining, working area with fire-place for cooking. Visitors look after themselves, this was no catered holiday location. Within a few minutes I was asking the volunteer staff if I could stay longer than the one night. The feel of the place was very special. While there, I took an accompanied walk through the rainforest with Ainare, a volunteer wildlife veterinarian from the Basque country, who had been living up here eight months at this stage and had no plans to leave – despite the isolation and lack of creature comforts. I could see the attraction. Walking through the rainforest is a difficult experience to describe – massive trees, growth everywhere even up trunks, a feeling of being enveloped. Some find it claustrophobic, I don’t. 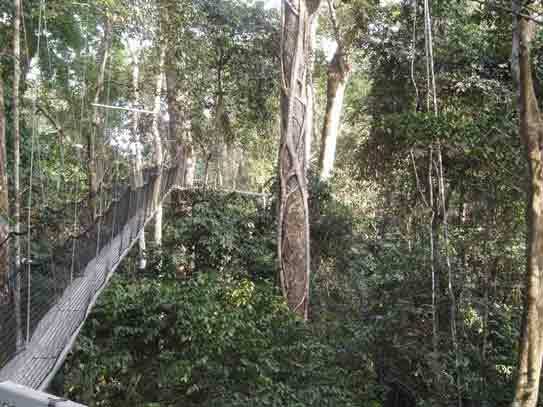 From the 400m Canopy walkway – the longest in Africa – you get a different perspective of the rainforest, up in the tree tops. 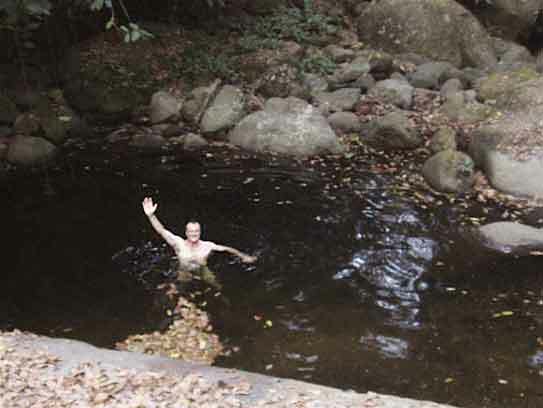 A swim in the river was like a Bounty advertisement, and especially welcome in the very humid heat. We spent about an hour at the fence of an enclosure observing some Drill monkeys, just sitting watching them scrabbling for food, grooming each other, scampering about playing. The ‘Alpha’ male, or leader, was pointed out to me, with his females, and also the Pretender, a younger male who I was told had designs on the leadership. He didn’t quite challenge the leader, but kind of hung around, testing it seemed how close he could come. This particular leader had a limp and was seen as possibly vulnerable. Quite extraordinary to watch the behaviours, the shapes being thrown. Some estimates put the remaining numbers in the wild at as little as three thousand of these animals. To put that into perspective, there are approximately 100,000 endangered mountain gorrillas said to be left. “The males have developed quite a rapid recovery rate from injuries,” Ainare told me. “About three times faster than a female..” Survival of the fittest - obviously an injured male that recovers quickly, is more effective. “These animals are at a peak of evolution. We can’t just let them disappear.” She argued passionately the case for not allowing their extinction. The chimpanzees were another fascinating draw. There is an enclosure for orphaned and donated chimps, though they are prevented from breeding as they are not endangered. Liza back at the Ranch in Calabar, had mentioned that some seemingly quite perverse behavior has been observed among these primates in the wild. Jane Goodall’s research among chimps in the Cameroon had discovered evidence of territorial wars, hunting of other chimps, and actual cannibalism. Ainare described to me examples of their intelligence. When I asked how they opened coconuts, a major part of their diet, I was told they hit them with a big stick, or smash them against a rock. Once, she was handed a bunch of leaves off a particular plant to protect her hands so she could strip the bark off a spiny plant for a chimp. The night before leaving, there was a terrific electrical storm, lighting up the sky and jungle, the thunder so powerful the air vibrated the walls of my tent. And as it went on well into the night I became convinced I would be marooned here, the roads impassable, and wondered had I made a wrong decision staying the extra day. I didn’t have enough food. Of course all was well the following day, the water drained off the red dirt roads leaving not much mud. During the night my imagination had conjured up pictures of quagmires and huge ponds of water. My departure at the border post of Ikom illustrated a few sides of the country for me. The first encounter was with the customs officer at the gate who then sent me up to the office above him. The carnet stamped, I was told to visit the police across the way before being on my way. It took three officers, next to each other in the same small room, to deal with me one after the other transcribing details into a ledger. As I had come to recognise in similar situations, there was a good guy, bad guy act, the first softening me up, the second, a plump, grumpy woman, notably unfriendly and officious trying to catch me out. The third, the superior, was chatty and wanted to talk about Ireland and my journey. My antennae were out for requests for “something for me’ and I usually successfully head it off at the pass by discussing Self Help, the charity I was raising publicity for! When I was asked was I married, and why not, I changed tack from the usual “too young for that” crack which wasn’t really raising the laugh it had before (now it was, “No you’re not. You’re old.”), and replied maybe I would find a wife in Africa. That went down very well, even the formerly frosty female officer loved it, saying she had a sister I’d like, the other officers having suggestions too. I’d use that one again! And on to the last but one official at the gate. He also had to check my passport, noting my visa was expiring today (which I hadn’t noticed), and trying to elicit a fee from me, knowing however he was shaky ground. My final dealing with Nigerian officialdom was just before mounting my bike. Hungry, I wanted to spend the last few pence I had in Naira on a few bananas but didn’t have enough. A Customs man chatting at the stall ‘dashed’ me a bunch - absolutely contrary to what was supposed to happen! He just gave them to me. A nice farewell to Nigeria. It was a dramatic border. Crossing a narrow bridge spanning a spectacular river gorge I entered Cameroon. The entry procedures were relatively straightforward and casual, the border guards joking with me. After a feed of garri – a cassava porridge with meat soup - it was off on the dreaded road to Mamfe. This road has a reputation as being particularly difficult. However it wasn’t. Slow enough the first forty kms, I felt comfortable enough, having dealt with worse in Nigeria. There was evidence of serious mud – I banged my panniers on deep dried furrows of it – and it would have been a different story in the rainy season, particularly in four wheels. At least a bike could skirt around the the large mudholes. It was fairly poor piste – eroded red dirt and sand – but manageable without much drama. After Mamfe it seemed to be better graded, though fourth gear was more an aspiration than a reality. The scenery was magnificent, a continuously winding track through mountain rainforest, interspersed with banana plants and palms. The red dirt road disappearing into the vivid green forest made a dramatic picture. One of the most scenic days yet. 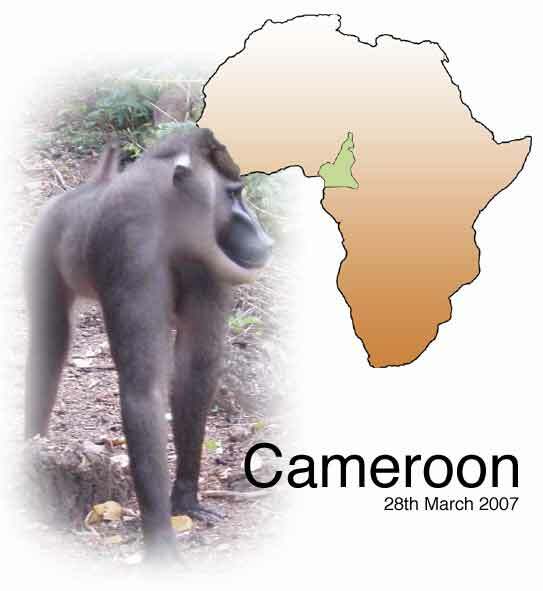 Although formerly a German colony, after World War I this part of Cameroon was governed by Britain (the central and southern areas by France) and English is understood. Disconcertingly at times, the people, rather the young men, were “in my face” when I might stop to buy water, a snack, or confirm directions. At first the attention was almost intimidating. One occasion in particular, a local cocoa farmer (I asked him) among the group seemed quite aggressive. I didn’t take it personally, and it was interesting to note that when I addressed him directly, answering his questions genuinely and asking some, he seemed to come around – indeed warning off a couple of other young smart asses who apparently were suggesting exacting a ‘toll’ from me. In another town, I had a similar experience. Stopping for directions at a fork – I try and choose someone who looks to have some appearance of ‘worldliness’ about him – I happened to ask a teacher, who instantly took personal responsibility for this strange arrival dropped onto his patch at the junction. As the inevitable crowd gathered, an argument broke out, voices were raised and things became quite heated. I was to experience this further into central Africa and knew it was a cultural thing that didn’t necessarily mean what it would in Ireland. Remaining unperturbed seems to be the best strategy, not rushing off. My defender had a stand off with one character, accusing him of saying “silly things” about me (what, I didn’t know but was a little alarmed!) and prevailed, the other backing off. It calmed down and he wouldn’t let me part before ensuring I knew exactly where I was, the name of every village before my destination of Bamenda, and the hills involved. Also that the tarmac would start within twenty kilometres, which was a relief as the evening was approaching and I wanted to get to the city before dark. He wrote down his address, and it was on the many occasions like this I enjoyed reaching into my tank bag and handing him a “KilkennyToCapetown.com” sticker with the map indicating the route through Africa, pointing out where we were. This was always well received (except sometimes by checkpoint or border guards who would be angling for something a bit more substantial!). The air temperatrure dropped as the evening fell. This was so refreshing after the months of heat, indeed I had to stop, put on an extra shirt and do up all the vent zips on my jacket. 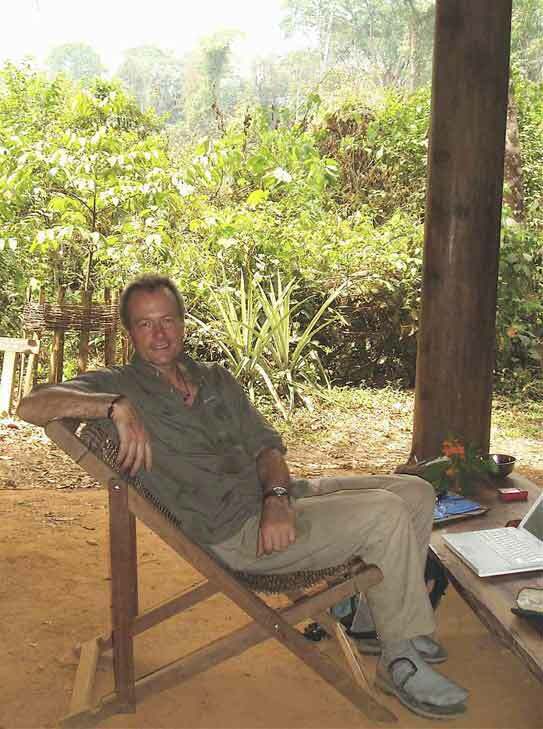 We were in the Central Cameroon highlands. Later that evening in Bamenda, I chatted with two sisters and a brother who, when I asked, told me they had been speaking in their native tongue, Fang and were from neighboring Equitoreal Guinea, a tiny country with a well developed petroleum industry. They were studying Business here in Bamenda as it was through English, which was necessary if you wanted work with the multinational oil companies. When I asked if they enjoyed the town, there was a pause, before a brief – yes. When they learned I understood some Spanish - Equitorial Guinea is the only Spanish speaking country on the continent - they told me they couldn’t wait to leave. “It is the most violent city in Cameroon,” said one sister, with a grimace on her face. “We don’t go out at night because people give us trouble all the time. They think we have money, and always want some from us.” Even at weekends they stay in, or visit the bar of this cheap hotel I was staying at across the way from their digs. I later read the Fang people used to be feared as cannibals. I had taken the bike out earlier in search of something to eat – something I don’t usually do, but the hotel was situated a little away from the night time activity – and slowing around a corner, there were shouts and calls to me. This was not unusual, and I’ve learned to ignore it, but on this occasion some shouts were very insistent, and one guy actually came running after the bike, trying to grab it! It was the only time on the trip I got a feeling of discomfort in a town. The next morning I was keen to have a cup of Cameroon coffee. This proved a bit of a challenge despite the fact we were near the quality coffee growing area. Eventually I managed to track some down at the NWCA Coffee House, where they charged the same price as the ubiquitous Nescafe found everywhere else. I recalled a similar phenomenon in Brazil – home of the coffee bean – not finding a decent cup until Argentina where every town had a café serving good espresso coffee. Just because the bean was native to a place didn’t mean it was part of the culture. Instant coffee it seems is a lot more convenient. After sending a congratulatory email to Mark McParland on Bective Rangers’ 125th anniversary I set off for the capital Yaoundé. The countryside was a lot more tamed with little forest left, and greater population. The fields struck me as very tidily organised, in marked contrast to Nigeria. The weather got warmer and muggier as the altitude dropped. Approaching Yaoundé, I was caught in my first rain – the heavy downpour stinging me through my jacket - drenching me within seconds before being able to find shelter. I had no rain gear having lost it on the road to Timbuktu! And rode right into rush hour in Cameroon’s capital, on a Friday evening, raining - just to make it a little bit challenging for myself. Finding the Presbyterian Mission, I discovered I was sharing the grounds with two overland trucks – the first I’d come across on the trip. They were on their way down the west coast as well, full of young partying English and Aussies. Some of the Aussies, true to their national stereotype, were serious drinkers and a good laugh. Chris had lived in Fairview (he met Bertie in The Gravediggers) for three months. As he put it, it was a difficult time – he was splitting up with his girlfriend, he arrived in November for the winter, and was working for the Complaints department of Eircom. Yet he enjoyed Dublin! It was an enjoyable few days around their company, bringing back memories of a former life. I didn’t miss it. News from the drivers of conditions ahead was not too encouraging. Angola was suffering severe flooding the previous two weeks. With the anticipated heavy going in Congo yet to be encountered I reviewed the estimated arrival time to Cape Town, pushing it back two weeks. Returning on the Monday, all was well, the delivery was there, and it was just a matter of clearing it through Customs – and duty of €180 - before it would be released to me! After negotiating with the officer (“How much can you pay?”) he agreed to release it to me for a much more reasonable figure, and I left the building happily clutching my delivery. It was then up to Roland’s workshop. While looking for accommodation on entering Yaoundé on Friday, a Yamaha Tenere had pulled up next to me –the first serious off road bike I’d seen in Africa. After a brief chat in the rush hour traffic, the local rider had urged me to visit Roland, well known here as a keen off roader in his day (“He’s crazy. He does things on a bike no one else would attempt!”). Finding his workshop, he welcomed me and was a great help, offering whatever assistance I needed, and not accepting any payment. 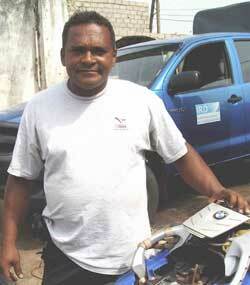 Roland had some tales about off roading in Cameroon. In one event through the forest a few of them stopped at a village for directions to find it deserted, though with signs of life all around, cooking fires still burning, clothes drying, huts with signs of occupation. But nobody around. They had fled into the forest in fear at the sound of the arriving bikes. In the DHL delivery along with the TKC 80 tyres, there was a new DID x-ring chain and sprockets. These had been organised and sent by BMT Tyres in Blanchardstown, the delivery generously paid for by PM Motorcycles in Mountrath. (Also included were enough Barry’s tea bags to keep me going to South Africa and back again!) The chain and sprockets still had a few thousand kms left on them despite not having being greased all the way from Ireland. 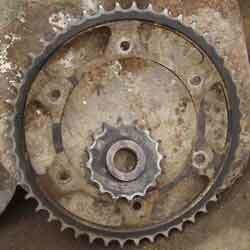 The accepted wisdom is that in the north African conditions the dust and sand sticks to the grease, serving as a grinding paste, actually wearing the chain and sprockets quicker. My tyres too had a few thousand kms left on them. Roland was grateful for them. My birthday fell that weekend which was handy. I celebrated in a nearby restaurant Les Feuilles Vertes with a delicious local dish – N’Dole with Capitaine Fumé, the meaty fresh water fish in a tangy, tasty spinach based sauce. Later, along with a couple from the overland crowd – the others were happy staying with the trucks drinking beer and making their own entertainment, a familiar phenomenon - I wanted to experience some local entertainment and we found ourselves at an outdoor party in the locality. Initially things were subdued, a few beers (Guinness – strong at nearly 8% and popular through W Africa), then the drums came out. Two large standup tom toms, a few djembes and various other percussive tools. Slowly the energy picked up, and a few girls began gyrating to the beat. This continued picking up momentum until later the rhythm seemed to cross into that transcendent zone – absolutely mesmerising, almost hypnotic. And the dancing became frenetic, the dancers giving themselves totally to the music. I couldn’t stay in my seat and, as was my usual habit, hung out at the back of the crowd, unable to resist moving to the whole thing. Partygoers were taking turns dancing in front of the drummers for a few minutes, and a few attempts were made to get me involved which I managed to resist, despite one very determined effort by quite a strong young one to physically haul me in. Of course as the only ‘blancs’ there it was difficult to remain anonymous. When the main man leading the dance insisted I step up, there was no way out and I reluctantly took my turn. These folks were throwing their whole being into the rhythm, and with some skill. It was intoxicating to be a part of it. A great birthday! Despite the indulgences, the overlanders company, and the big city distractions it felt good to be on the road again, heading south. 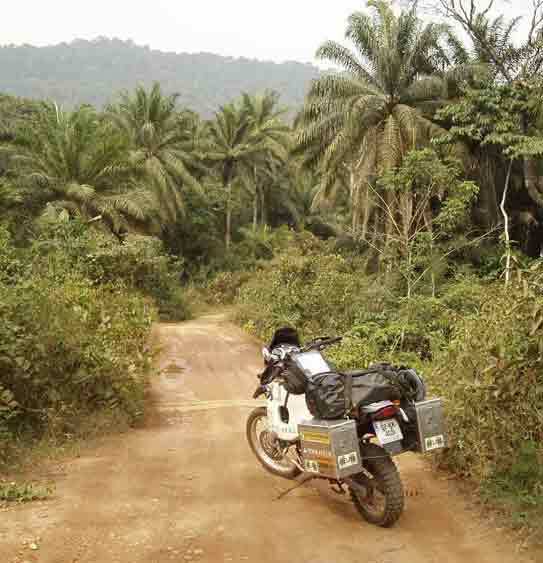 A half days ride brought me to the border with Gabon, and the Central African jungle.